As soon as my girls could walk, they also started to climb. They couldn't wait to climb onto their toy rocking horse, the sofa, and me. Today, they enjoy tackling rock walls at our local gym. Have you ever stopped to wonder why kids climb? It's actually fundamental to their development and helps kids in nine ways. We need to keep our kids safe as they play, but our kids need healthy risks, too. Climbing allows our kids to test their bodies and capabilities, explore their surroundings, and develop confidence. For these reasons, I'm a firm believer in providing climbing opportunities for our children. Our kids use a variety of gross and fine motor skills as they function every day. Their brain, nervous system, and large muscles work together to help them perform gross motor skills such as rolling, sitting, and running. Fine motor skills describe precise actions like holding a pencil, closing buttons, and picking up small objects. 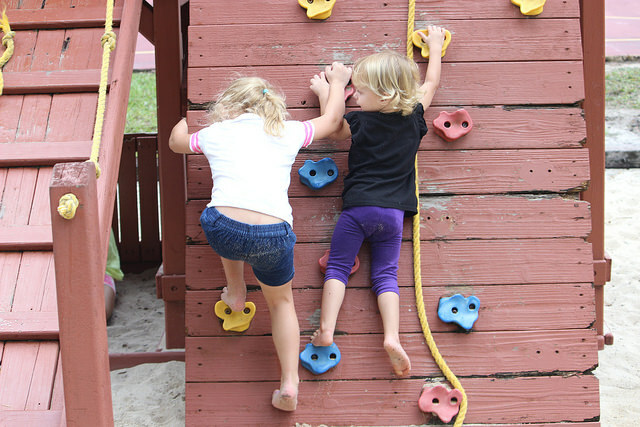 Our kids hone these motor skills as they climb and navigate obstacles. Spatial awareness describes our understanding of how our bodies move, how shapes relate to each other, and how far we need to stretch to reach an object. With spatial awareness, our kids successfully navigate obstacles as they walk and run, do math problems, and read books. 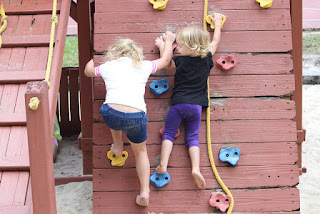 Let's increase our kids' spatial awareness with climbing opportunities. To get dressed, read, write, cook, or assemble furniture, our kids rely on hand-eye coordination. It describes the way their brain, eyes, and hands work together to equip them to accomplish tasks. Our kids hone this life skill on the climbing wall and jungle gym. Climbing is like a puzzle. Our kids analyze the summit, decide what route to take, and follow through on their plan. If they discover along the way that their original path won't work, they rethink their strategy and adjust. Whether our kids climb the sofa as toddlers or tackle rock walls as teens, climbing enhances their ability to solve problems. Physical activity improves our kids' memory, concentration, test scores, and behavior, essential skills for successful school performance. If you're like me, you want your kids to succeed in school, and that's why we should encourage our kids to climb. I want my girls to feel confident in their ability to meet life's demands. Climbing offers the perfect training ground for them to develop these skills. Once they master small climbing goals like reaching the top of the kiddie sliding board ladder, they're ready to try harder summits. Over time, achieving their goals stretches their confidence, builds their self-esteem, and gives them pride in a job well done. When my girls face personal, school, or relationship challenges, they need to exercise perseverance and resilience. These character traits reduce stress during trials and help our kids bounce back faster after adversities. If you watch your kids climb, you'll see them develop perseverance and resilience as they make plans, adjust those plans if necessary, manage impulses, follow through on their decisions, and improve their self-image. Kids need 60 minutes of physical activity each day, and my girls like climbing because it works out their entire body. They use their fingers and forearms to grip the climbing holds, their abs and core to lift their legs, and their entire body to push themselves upward. All of these actions work together to strengthen muscles and build endurance. The cardiovascular workout, flexibility, agility, balance, and leg strength our kids gain from climbing help them play other sports and function better in daily life, too. Most kids, including my girls, start climbing as soon as they can move. I'm glad because climbing helps our kids develop in nine important ways. What other benefits do your kids gain from climbing?